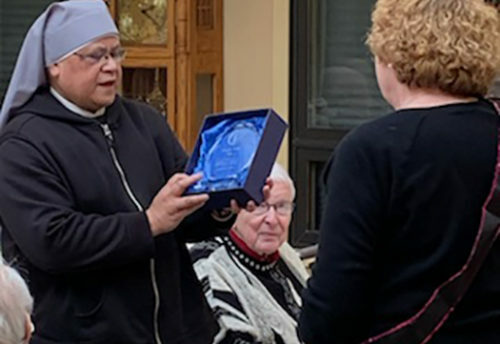 As we Little Sisters’ have been listening to the audiobook of Fr. Lelievre in the refectory, we come upon the idea came from to take the travelling Banner for a trip down the Mississippi knowing that some of our first Little Sisters who set foot on US soil had to travel down the Mississippi reach to New Orleans. Even though we are closer to the Headwaters of the Mississippi than New Orleans we felt drawn to this idea. 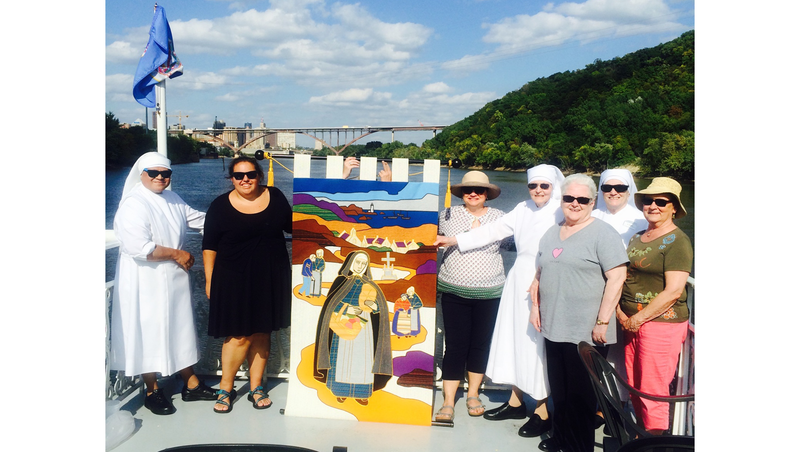 A group of 8 gathered to make this little pilgrimage down the Mississippi. 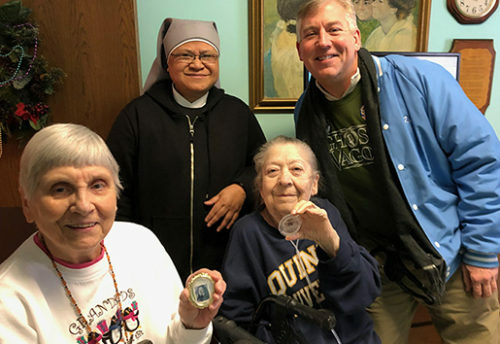 Residents, AJJ members, a young woman who is discerning and three Little Sisters. 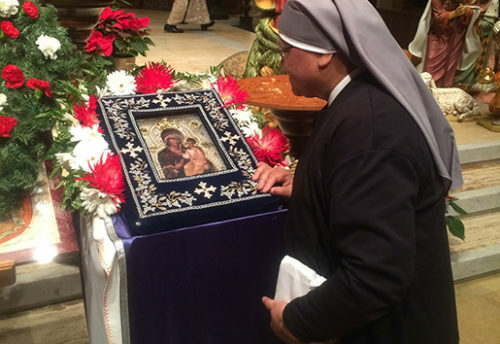 Before we leaving for the short drive to Harriet Island, we prayed the novena prayer to Saint Jeanne Jugan. It was a beautiful September day; there were many people onboard the paddle wheeler, including a group of elderly people. Everyone enjoyed the breeze and the beautiful sun and blue sky. Cindy, a member for the Association Jeanne Jugan, opened the bag and put up the banner. Jeanne Jugan looks so good on the water we were very careful not to drop the banner in the water. (It didn’t happen!) Everybody was watching us putting the banner up. We prayed the Novena prayer again. As we were exiting the boat, Cindy whispered to me: we need to go to the site of the first church in St Paul. It is very close by, just across the river. We arrived at this place, it was a small park. A big boulder is there with a plaque commemorating the first church named St. Paul. 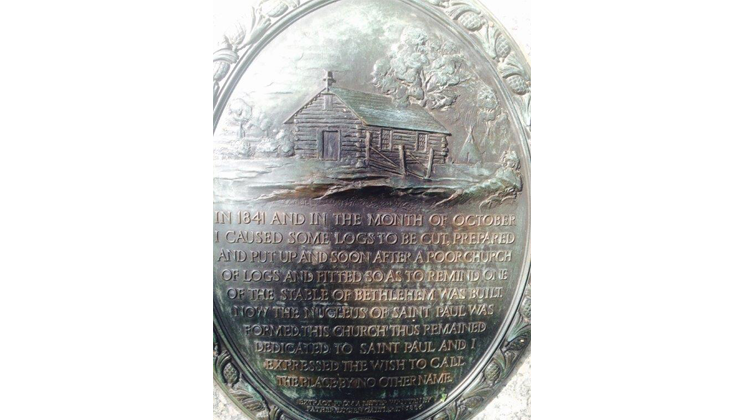 “Chapel of St Paul: In 1841 Father Lucien Galtier built a small log chapel about a mile down river from Pig’s Eye (approximately where Robert Street meets the river). He named it the Chapel of St. Paul and urged its members to refer to the area as St. Paul. Before it had been known as Pig’s Eye. That’s how St. Paul came to be. Of course, we placed the banner right next to the boulder. We prayed the novena prayer and admired the simplicity of the place. We continued on with our pilgrimage, packing up and heading to the Cathedral. We arrived at the Cathedral only a few people praying inside a big group of elderly praying the rosary in the chapel of our Lady. We placed the banner in front of the altar rail. 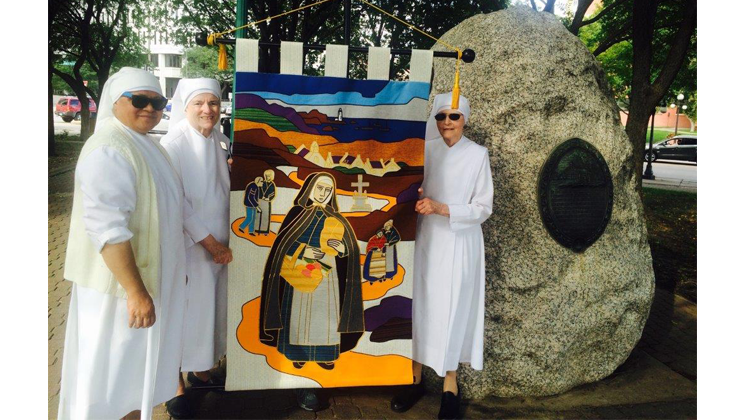 Of course, we prayed Novena prayer and we felt very good to have made this pilgrimage to take the traveling banner around the city. We stood with the banner outside the Cathedral facing the Capital. 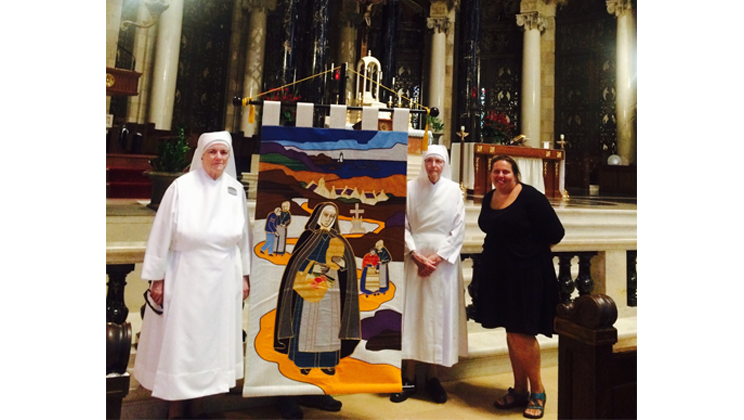 Next week we hope to take the banner to the Cemetery to visit our Little Sisters.